4 Bedroom Semi Detached House For Sale in Winchester for Guide Price £650,000. This charming Grade II listed property was built in 1896 by the renowned architect Sir Edwin Luytens and originally served as the village stores. With a wealth of period features and neutral, well presented decor, the property offers a potential purchaser the opportunity to update the property to their own needs and tastes. To the front of the house is a bright living room with the large bow-fronted window, making a charming relic of the building’s former use. Across the hall is a further spacious L shaped reception room currently arranged as a sitting/dining room. Ideal for entertaining, this triple aspect room also boasts a wealth of natural light and a beautiful fireplace creating an attractive focal point. To the rear of the property is a country-style kitchen fitted with cream cabinets, dresser units for displaying crockery and a range cooker set in a chimney alcove whilst additional storage is available in the walk in larder and the adjacent utility room. A ground floor w/c completes the accommodation on this level. On the first floor there are four bedrooms including a delightful master bedroom with fitted wardrobes and an en suite shower room. The family bathroom comprises a four piece suite including a bath with shower over. Occupying a central position in the popular village of Micheldever Station, the property is within easy reach of the village pub, playing fields, community centre and excellent transport links including mainline rail links to London Waterloo in approx. one hour. Further amenities are available in the larger towns of Andover, Basingstoke and Winchester, all within 12 miles. The A303 is under a mile away which along with the M3 give easy access to Gatwick and Heathrow airports, the coast and the South West. 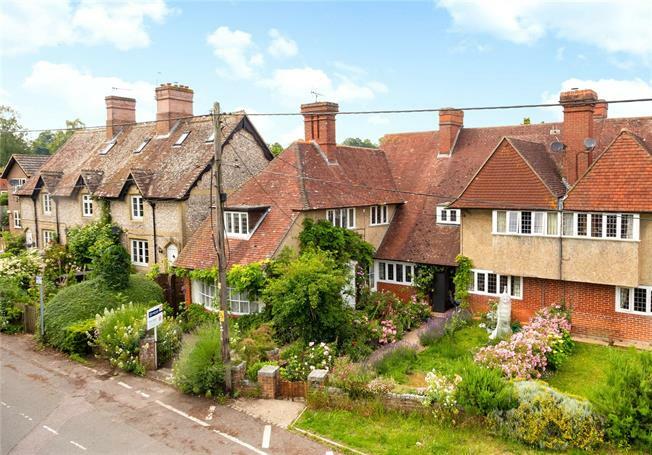 There are a variety of schools available locally including a village primary at nearby Micheldever and a wealth of independent schools in Winchester. The location also provides country pursuits on the doorstep which can be enjoyed in the stunning surrounding countryside. The house is accessed via double iron gates set in an attractive brick wall, leading to a paved area with a variety of shrubs and climbers providing year round interest plus a small pond. A side gate leads to the rear where the garden blends mature planting with modern landscaping, including a pretty paved circular patio surrounded by well-stocked beds adjacent to the house. A wooden archway and steps lead to an extensive lawn area with a path extending to the rear where there are large fruiting apple trees and a greenhouse. At the boundary there is a detached brick built garage and car port providing off-street parking. Additional on-street parking is also available to the front of the property. SERVICES: Mains water & electricity. Private drainage. Oil fired central heating.